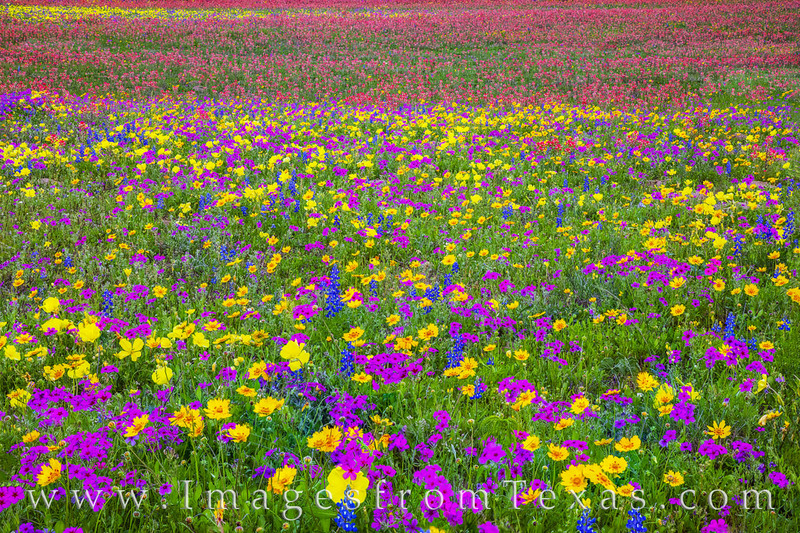 This collage of Texas wildflower color comes from a quiet road in New Berlin, Texas. Just east of San Antonio, spring in this area in rare years can offer an explosion of beauty unparalleled anywhere in Texas. This image was taken with a small zoom lens to highlight only the colors of the flowers and to show the textures and vibrance of this amazing area. The colors don’t last long, but while they do, this area is a sight to enjoy. Made up of several varieties of flowers including coreopsis, groundsel, and Missouri primrose (all golden yellow), Indian paintbrush (red), phlox (purple) and even a few bluebonnets, the colors filled the entire field. Photo © copyright by Rob Greebon.